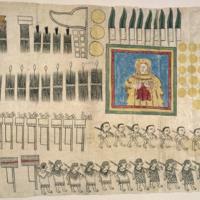 This painted manuscript comes from Huejotzingo, an indigenous community in Central Mexico. This is one page of several in the manuscript, painted with black ink and colored paints on maguey-fiber paper. The items depicted here—from the gold coins at the far right, to the male and female slaves near the bottom of the page—represent the tribute presented by the people of Huejotzingo to the Spanish official, Nuño de Guzmán. The page relies on Nahua pictographic notation. The sign that looks like a bundle of sticks indicates 400, and the rectangular banner stands for 20. These numerical signs are attached to signs for objects. For instance, the small footprint seen in the upper left attached to four of the signs for 400 refers to pairs of sandals. All told, the manuscript registers 1600 pairs of sandals given as tribute. To the left of the sandals are 400 cotton mantles and 400 jars of liquidambar. Below are the 4000 (10 x 400) arrows contributed to Nuño de Guzmán’s war efforts. Below the arrows are the banner signs. They show 200 sets of male clothing, and 60 leather-covered chests. At the right edge of the image, 21 gold disks stand for the money paid to purchase a horse for a local leader to ride into battle alongside Nuño de Guzmán, the colonial official who collected this tribute in Huejotzingo. This image of the Virgin and Child is not, as is typical in the paintings of New Spain, a devotional image or focus of prayer. Instead, it represents a banner of feathers and gold made in Huejotzingo for Nuño de Guzmán, the local Spanish official, to carry into battle. At the bottom right of the page, one row of eight male slaves and one row of twelve female slaves appear. 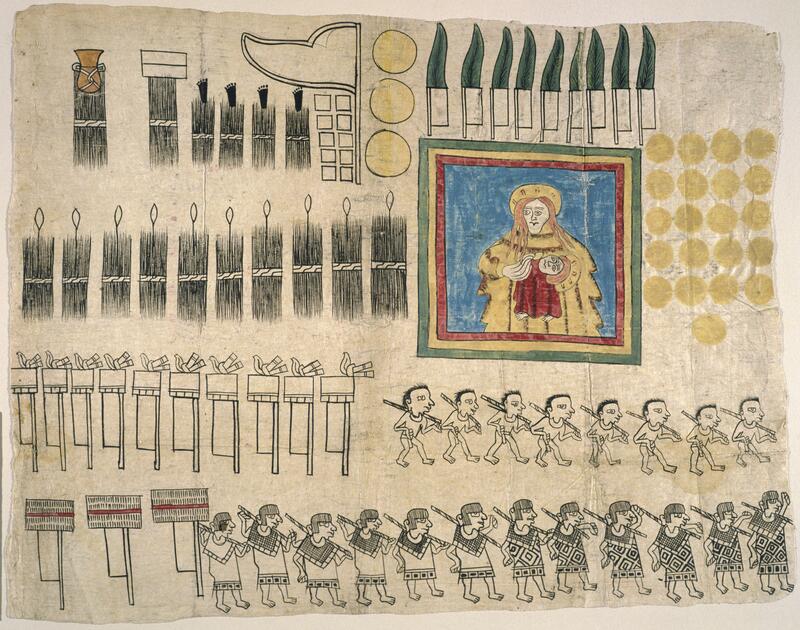 The twenty were sold by the people of Huejotzingo to raise money to create the banner of the Virgin Mary shown above. This manuscript painting—one of eight pages of pictographic texts—was entered into court in a suit the conquistador Hernán Cortés brought against several colonial officials. It is not clear whether these pictographic paintings were created explicitly for the 1531 lawsuit, or rather already existed and were simply included as evidence. In either case, the indigenous painter was clearly some one well-trained in pre-Hispanic techniques of representation. Created by an indigenous hand, the image exhibits many of the standard conventions of pre-Hispanic tribute lists. Not only are most items outlined in a thin, crisp black outline, but each figure and object is also set into a horizontal row against a blank background. The signs and symbols used—with the exception of the Virgin and Child and the gold coins—have pre-Hispanic origins, as does the practice of painting on maguey-fiber paper. This painting, which may have originally been intended as a register of accounts, was entered as evidence in court proceedings in New Spain in 1531. In this lawsuit, Hernán Cortés, who headed the conquest of New Spain, claimed to have been cheated out of the indigenous tribute that was his due. The manuscript painting served as evidence of the goods and services paid out by the people of Huejotzingo, and became part of a long court file written in Spanish. Today, the manuscript is in the Library of Congress in Washington, D.C. Painted just a few years after the Spanish conquest, this image confirms that pre-Hispanic traditions hardly died out with the arrival of Christianity and Spanish customs. In this case, the pictographic account book was used both before and after the Conquest. The image also suggests one way painters in the first years after the Spanish conquest “made room” for new, Christian images, like that of the Virgin, yet did not invite those images to interfere with modes of indigenous representation that were well practiced and still meaningful. At yet another level, the use of the manuscript in court suggests how Spanish authorities sought to balance their own traditions against those they encountered in central Mexico. Only after having been “read” out loud, with a scribe to record the recitation, was the painting considered binding evidence. In a similar vein, in pre-Hispanic traditions, oral recitation and painted imagery, together, created significant meanings—neither recitation nor painting alone was sufficient. Albro, Sylvia Rogers and Thomas Albro II. 1990. “The Examination and Conservation Treatment of the Library of Congress Harkness 1531 Huejotzingo Codex.” Journal of the American Institute for Conservation 29 (2), Article 1: 97 to 115. Boone, Elizabeth H. 1998. “Pictorial Documents and Visual Thinking in Postconquest Mexico.” In Native Traditions in the Postconquest World. E. H. Boone and T. Cummins, eds. Washington, DC: Dumbarton Oaks,149-199. Cummins, Tom. 1995. “The Madonna and the Horse: Becoming Colonial in New Spain and Peru.” In Native Artists and Patrons in Colonial Latin America. E. Umberger and T. Cummins, eds. Tucson: University of Arizona Press, 52-83. The Huejotzingo Codex/El Códice de Huejotzingo: A Facsimile of the 1531 Huejotzingo Codex in the Harkness Collection. 1995. With essays by Xavier Noguez, Sylvia Rogers Albro and Thomas Albro II. Washington, DC: Library of Congress.